This talk begins with a review of the extensive critiques of community offered by Joseph and other scholars of critical and cultural theory. While earlier analyses focus on the racist and exclusionary implications of community, these works examine deployments of community as a supplement to capitalism and neoliberal governmentality. Meanwhile, there have been widespread efforts in critical and cultural theory to articulate visions of collectivities that would not be liable the earlier concern. Guided by José Esteban Muñoz’s rich, sophisticated, and persistent contributions to the effort to envision such alternatives, and especially queer-of-color collectivities, this presentation surveys the various theoretical resources and terms on which he drew, from publics and counterpublics to affect to commons. Finally, this presentation explores how those efforts engage the relation of the collectivity to capitalism and governance. 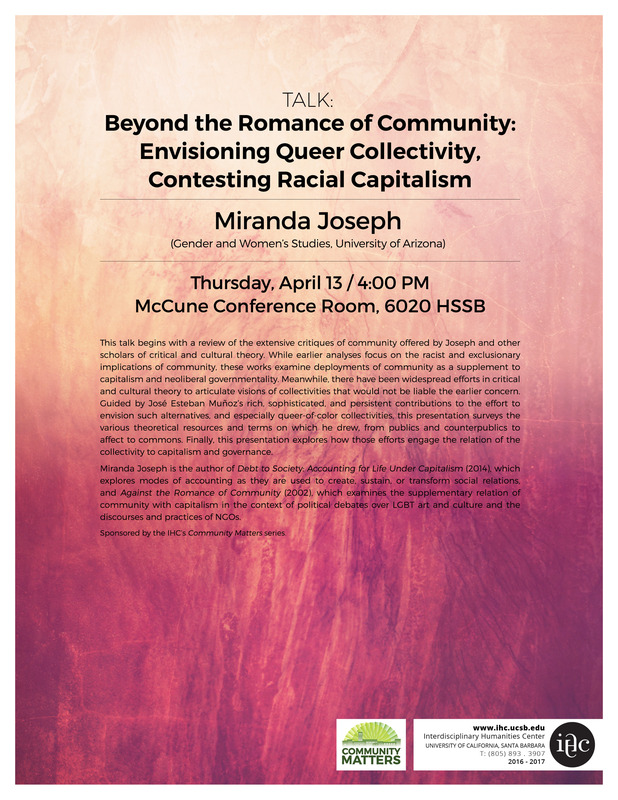 Miranda Joseph teaches feminist, Marxist, poststructuralist and queer theory, cultural studies methods, and LGBT Studies. Her research uses the tools of cultural studies to theorize the relationship between economic processes and social formations. She is the author of Debt to Society: Accounting for Life Under Capitalism (2014), which explores modes of accounting as they are used to create, sustain, or transform social relations, and Against the Romance of Community (2002), which examines the supplementary relation of community with capitalism in the context of political debates over LGBT art and culture and the discourses and practices of NGOs. She has undertaken many administrative and faculty leadership roles, including Chair of the university’s Strategic Planning and Budget Advisory Committee, 2007-2009. She is currently Co-chair of the Program Committee for the Cultural Studies Association 2016 conference. She received her PhD in Modern Thought and Literature at Stanford in 1995. Sponsored by the IHC’s Community Matters series.